Doctors are the latest group to use Twitter to make the case for gun control, going viral with pictures graphically showing the impact of gun violence on U.S. society. Driving the news: The mass response comes after the NRA tweeted that doctors should "stay in their lane" as a response to a paper released by the American College of Physicians. 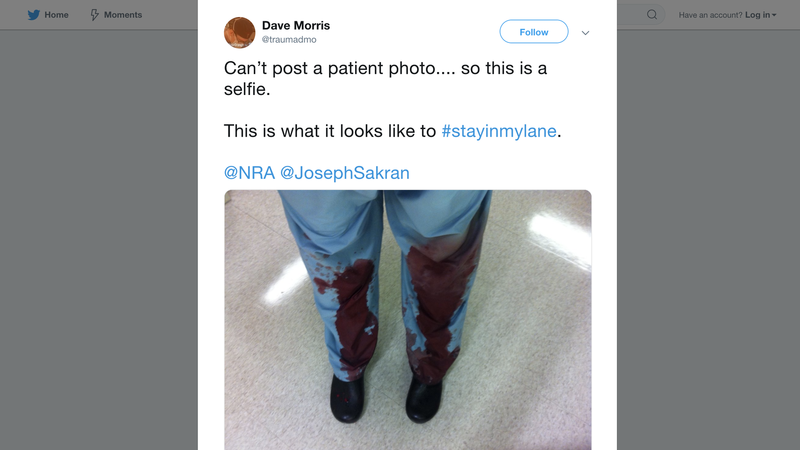 Doctors seized on the NRA tweet, responding with bloody photos and a variety of hashtags, including #ThisIsMyLane, #ThisIsOurLane and #ThisisEveryonesLane. Among the early rebuttals to the NRA was this tweet from forensic pathologist Judy Melinek: "Do you have any idea how many bullets I pull out of corpses weekly? This isn’t just my lane. It’s my f---ing highway." She expanded in an essay for Vox. General surgery resident Lauren Nosanov: "Hey @NRA, they say if you want to understand someone’s perspective, you should walk a mile in their shoes. Just be prepared, because ours are covered in blood." Surgery resident Danielle Kay: "Dear @NRA , Until you’re covered in blood and pronounce someone dead in the trauma bay, or told a mother that her child is dead, or sewed someone’s scalp together so their family doesn’t have to see their brain matter, please don’t tell me what my lane is." Why it matters: The doctors are following a well-trodden path in trying to use social media to try to break through the perennial legislative logjam on gun control. The Parkland students and parents who have lost children to shootings have also achieved powerful viral messages. However, none of these efforts has yet succeeded in getting Congress to act. Our thought bubble: Beyond the substantive arguments about how to end gun violence, the hashtag campaign also raises questions about how Twitter and other platforms will handle disturbing content. If outraged health care professionals up the ante and show increasingly gruesome images, the platforms may feel they have to step in and draw lines. But displaying the outcome of gun incidents in all their bloody horror is the whole point of the campaign. Mergers are central to media companies' strategies for competing with tech giants like Google and Netflix, but the merger review process has suddenly become a political football between President Trump and congressional Democrats, Axios' Sara Fischer and David McCabe write. Why it matters: Trump continues to comment on antitrust matters related to media companies he doesn't like, and experts worry the resulting political fray could hinder the Justice Department's ability to independently evaluate mergers. Media companies looking to merge amid an already difficult economic climate now have to consider this reality as a part of their business decisions. What's happening: Consumer groups are raising red flags about both the AT&T/Time Warner merger that was approved this summer (after the Justice Department tried to block it) and the Comcast/NBCUniversal merger that was approved in 2011 during the Obama administration. Last week, the American Cable Association asked the DOJ to investigate Comcast/NBCU for antitrust violations. The president later tweeted about the industry group's lawsuit asserting that "Comcast routinely violates antitrust laws." Be smart: "There is a strong basis for enforcing these laws regardless of the White House's statements, but those statements in no way help the DOJ do its job effectively," says Gene Kimmelman, president and CEO of Public Knowledge, a consumer protection advocacy group, and a former Justice Department antitrust staffer. The big picture: These issues become even more convoluted as the DOJ faces a leadership crisis of its own. The resignation of Attorney General Jeff Sessions has some policymakers concerned that his acting replacement Matthew Whitaker, a Trump loyalist, will push the president's agenda — renewing fears that the DOJ's antitrust division isn't independent from the White House. Between the lines: Many of the alleged anti-competitive behaviors are connected with outlets — including NBC, the Washington Post and CNN — that Trump has attacked. Read more of the full story from Sara and David. Artificial intelligence pioneer Andrew Ng wants more people to learn more about AI. Since he is also the founder of Coursera, he did the natural thing — created an online class. Details: "AI for Everyone," is aimed at the non-technical crowd, including executives and the generally curious. It's not quite ready, but those interested can pre-enroll to be among the first to take it. Why it matters: "Artificial intelligence will transform every industry, just as electricity did 100 years ago," Ng said in a blog post, adding that AI will create $13 trillion in GDP growth between now and 2030. The new course is just one of several AI-related projects for Ng, who previously led AI efforts at Google and Baidu. He's also running Landing AI, which aims to help manufacturers change their businesses, and is leading the $175 million AI Fund. Rep. Darrell Issa said Monday the U.S. information system needs new ways to hold liars accountable — including journalists' anonymous sources and social-media disinformation providers, Axios' Kia Kokalitcheva reports from the Wall Street Journal's tech conference in Laguna Beach. What they're saying: "We have to have a result for the person who creates a lie, which we don't yet have,” Issa said. The retiring congressman cited the example of anonymous sources who tell lies to journalists but have their identities protected. He applied the same concern to lies spreading on social media. "If you’ve been hurt, and Facebook says, 'I'm immune,' then who is responsible and how do I get that data?” he later added, in reference to the Communications Decency Act's Section 230, which protects internet services from being liable for content posted by their users. Issa acknowledged the complexities that both constitutional free speech and press guarantees and traditional libel laws bring to any effort to hold misinformation providers accountable. The other side: Rep. Ro Khanna, who represents part of Silicon Valley, disagreed with Issa, saying that he's "all for a messy democracy," if that's the result of protecting freedom of speech. D. Live continues in Laguna Beach, California. Techonomy wraps up in Half Moon Bay, California. In the latest departure at Snap, VP of content Nick Bell is leaving the company. Facebook named Anne Kornblut, a former Boston Globe, Washington Post and New York Times journalist, to a new role overseeing news partnerships and new initiatives. Check out some cool iPad magic tricks.